When Pearlie Mae Tyler moved to Austin with her husband Johnny Tyler in 1974, everything was new. The couple decided to join the 4900 block club on Race Avenue to better know their neighborhood, and more importantly, to meet their neighbors. Forty years has passed, and that block club – once buzzing with parties and meetings – is not so vibrant. Activities are held sporadically, Tyler said, and there are few participants. “Right now, we are not doing anything; it’s just inactive,” Tyler said. 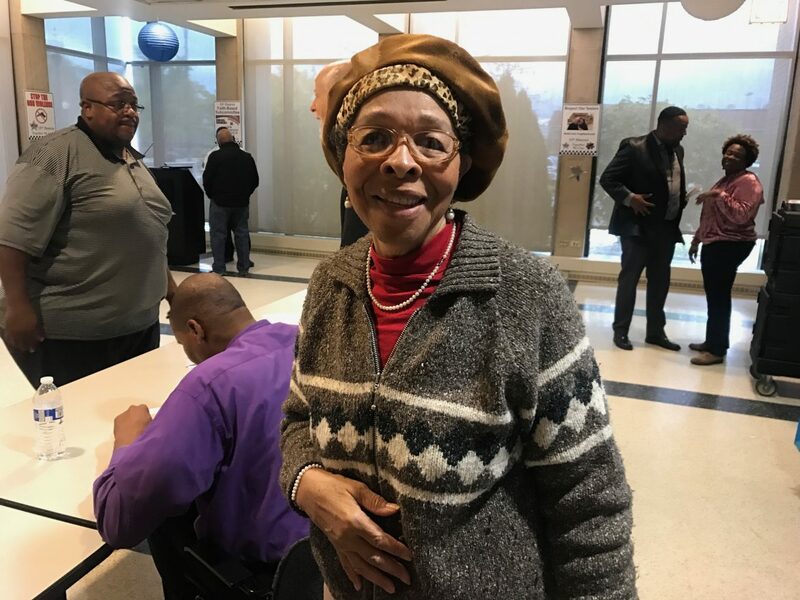 She and her husband attended last week’s meeting of ministers, residents and officers at the 15th District Police station where attendees discussed how to build a stronger community coalition in 2018. “People are not communicating and getting out to know their neighbors,” Tyler said in an interview after the Nov. 7 meeting. The lack of “personal relationships” has resulted in low attendance at many Austin block clubs, she said. Community participation could be a lot higher, said Rev. Steve Epting, pastor of Hope Community Church, who moderated last week’s meeting. “It’s 40 houses on the block with 400 people,” he said, but “they’re always just three people” who participate in the block clubs. While there are a lot of good things going on in Austin, “when you’re there, the turnout’s low,” said Jermaine Harris, the 15th District’s new sergeant of community relations, as he briefed about a dozen people about what police are focused on. Those in attendance included ministers from Friendship Baptist Church, Rock of our Salvation Church and King David Baptist Church, as well as representatives from Westside Health Authority, Northwest Austin Council and the Oak Park Regional Housing Center. Ernest Cato, the 15th’s new commander who replaced Commander Dwayne Betts after his recent promotion, did not attend the meeting due to a mandatory training for his transition, Harris told the group. While the strategy for 2018 will continue to be “unifying the faith-based groups, businesses, schools and police officers,” Harris said there needs to be increased efforts in better communicating with residents and improving participation. That focus will be reflected next year in the 100 Blocks & 100 Churches, an initiative that the 15th Police District has had in place over the past several years. The idea is to bring back “block clubs where citizens collaborate with the churches and the police department,” Harris said during an interview after the meeting. That will help residents build up networks and reduce crimes, he added. What will also remain unchanged: the goal of strengthening community outreach, he said, adding they will begin with bringing back the Christmas parade on Dec. 15. It will start at 5:30 p.m. that day at Cicero and Madison. Austin does not lack for churches, organizations and community events, but it needs better collaboration to increase turnout and involvement, Epting said. Residents, community leaders and church members agreed, saying building stronger relationship should be Austin’s priority in 2018. “Our agencies need better connections with the churches and the block clubs,” said Danielle Dixon from Westside Health Authority, adding there also needs to be collaboration among similar groups. Rev. Tom Walsh, pastor of St. Martin De Porres Church, proposed that the community pinpoint a few events that all groups commit to every year. The block clubs should be revitalized because that’s where people can meet each other in person, said longtime Austin resident Tyler, who encouraged residents to come out more instead of communicating on social media. “The most important thing we need is to get out of the house, get in next door and see who these people are. “Just form a relationship. Relationship makes things work,” she stressed. The 15th Police District faith-based group invites West Siders to its annual picnic 6 to 7 p.m. July 19 at Emmet Elementary School, 5500 W. Madison St.
More than 50 people gathered outside Friendship Baptist Church, at 5200 W. Jackson Blvd., a day after Sunday morning's shooting to speak out against the violence and urge people everywhere to fight for safe neighborhoods for all. The measure, which passed the Illinois General Assembly, would ban employers from requesting the information to gain access to personal details about current or potential employees.